For a territory, see Condominium (international law). For other uses, see Condominium (disambiguation). A condominium, often shortened to condo, in the United States and in most Canadian provinces, is a type of living space similar to an apartment but independently sellable and therefore regarded as real estate. The condominium building structure is divided into several units that are each separately owned, surrounded by common areas that are jointly owned. Similar concepts in other English-speaking countries include strata title in Australia, Malaysia, New Zealand, and the Canadian province of British Columbia; commonhold in the United Kingdom; and sectional title in South Africa. Residential condominiums are frequently constructed as apartment buildings, but there has been an increase in the number of "detached condominiums", which look like single-family homes but in which the yards, building exteriors, and streets are jointly owned and jointly maintained by a community association. Unlike apartments, which are leased by their tenants, condominium units are owned outright. Additionally, the owners of the individual units also collectively own the common areas of the property, such as hallways, walkways, laundry rooms, etc., as well as common utilities and amenities, such as the HVAC system, elevators, and so on. Many shopping malls are industrial condominiums in which the individual retail and office spaces are owned by the businesses that occupy them while the common areas of the mall are collectively owned by all the business entities that own the individual spaces. The common areas, amenities, and utilities are managed collectively by the owners through their association, such as a homeowner association. Scholars have traced the earliest known use of the condominium form of tenure to a document from first-century Babylon. The word condominium originated in Latin. Italy uses condominio, which is simply the modern Italian form of condominium. Both condo and condominium are used colloquially in the Canadian province of Quebec, where the official term is divided co-ownership. In France, however, the term is simply copropriété ("co-property"), and the common areas of these properties are usually managed by a Syndicat de copropriété, or "co-property union" ("union" in the sense of "association"). Latin American nations often use the term propiedad horizontal, literally meaning "horizontal property" but abstractly meaning that all owners of the property have equal interest. The word condominio is also used. However, in Spain, the legal term is comunidad de propietarios and the popular term is comunidad de vecinos. "Condominium" is a Latin word formed by adding the prefix con- ("together") to the word dominium ("domain, property, ownership"). Its meaning is therefore "shared property". Condominia (the plural of condominium in Latin) originally referred to territories over which two or more sovereign powers shared joint dominion. This technique was frequently used to settle border disputes when multiple claimants could not agree on how to partition the disputed territory. For example, from 1818 to 1846, Oregon Country was a condominium over which both the United States and Great Britain shared joint sovereignty until the Oregon Treaty resolved the issue by splitting the territory along the 49th parallel and each country gaining sole sovereignty of one side. The difference between an "apartment" complex and condominium is purely legal. There is no way to differentiate a condominium from an apartment simply by looking at or visiting the building. What defines a condominium is the form of ownership. A building developed as a condominium (and sold in individual units to different owners) could actually be built at another location as an apartment building (the developers would retain ownership and rent individual units to different tenants). As a practical matter, builders tend to build condominiums to higher quality standards than apartment complexes because of the differences between the rental and sale markets. Technically, a condominium is a collection of individual home units and common areas along with the land upon which they sit. Individual home ownership within a condominium is construed as ownership of only the air space confining the boundaries of the home. The boundaries of that space are specified by a legal document known as a Declaration, filed on record with the local governing authority. Typically, these boundaries will include the wall surrounding a condo, allowing the homeowner to make some interior modifications without impacting the common area. Anything outside this boundary is held in an undivided ownership interest by a corporation established at the time of the condominium's creation. The corporation holds this property in trust on behalf of the homeowners as a group—it may not have ownership itself. Condominiums have conditions, covenants, and restrictions, and often additional rules that govern how the individual unit owners are to share the space. It is also possible for a condominium to consist of single-family dwellings. There are also "detached condominiums" where homeowners do not maintain the exteriors of the dwellings, yards, etc. and "site condominiums" where the owner has more control and possibly ownership (as in a "whole lot" or "lot line" condominium) over the exterior appearance. These structures are preferred by some planned neighborhoods and gated communities. A homeowners association (HOA), whose members are the unit owners, manages the condominium through a board of directors elected by the membership. This exists under various names depending on the jurisdiction, such as "unit title", "sectional title", "commonhold", "strata council", or "tenant-owner's association", "body corporate", "Owners Corporation", "condominium corporation" or "condominium association". Another variation of this concept is the "time share", although not all time shares are condominiums, and not all time shares involve actual ownership of (i.e., deeded title to) real property. Condominiums may be found in both civil law and common law legal systems as it is purely a creation of statute. Among other things, the HOA assesses unit owners for the costs of maintaining the common areas, etc. That is, the HOA decides how much each owner should pay and has the legal power to collect that. The description of the condominium units and the common areas and any restrictions on their use is established in a document commonly called a "Master Deed" (also known as the "Enabling Declaration", the "Declaration of Conditions", or the "Condominium Document"). Among other things, this document provides for the creation of the HOA. Rules of governance for the association are usually covered under a separate set of bylaws which generally govern the internal affairs of the condominium. Condominium bylaws usually establish the responsibilities of the owners' association; the voting procedures to be used at association meetings; the qualifications, powers, and duties of the board of directors; the powers and duties of the officers; and the obligations of the owners with regard to assessments, maintenance, and use of the units and common areas. Finally, a set of rules and regulations providing specific details of restrictions on conduct of unit owners and residents are established by the HOA. These are more readily amendable than the declaration or association bylaws, typically requiring only a vote of the HOA board. Typical rules include mandatory maintenance fees (perhaps collected monthly), pet restrictions, and color/design choices visible from the exterior of the units. Generally, these sets of rules and regulations are made available to residents and or as a matter of public record via a condominium or homeowners association website or through public files, depending on the state and its applicable laws. Condominiums are usually owned in fee simple title, but can be owned in ways that other real estate can be owned, such as title held in trust. In some jurisdictions, such as Ontario, Canada or Hawaii USA, there are "leasehold condominiums" where the development is built on leased land. In general, condominium unit owners can rent their home to tenants, similar to renting out other real estate, although leasing rights may be subject to conditions or restrictions set forth in the declaration (such as a rental cap for the total number of units in a community that can be leased at one time) or otherwise as permitted by local law. Condominium ownership is also used, albeit less frequently, for non-residential land uses: offices, hotel rooms, retail shops, private airports, marinas, group housing facilities (retirement homes or dormitories), bare land (in British Columbia)) and storage. The legal structure is the same, and many of the benefits are similar; for instance, a nonprofit corporation may face a lower tax liability in an office condominium than in an office rented from a taxable, for-profit company. However, the frequent turnover of commercial land uses in particular can make the inflexibility of condominium arrangements problematic. There are many forms of real estate ownership that are similar to condominiums but not identical. Classic privately owned detached houses on privately owned lots may be part of a community that has a homeowner's association. Such an association may administer a common park area, for example, or an access road, or architectural standards for the houses. In a townhouse complex, multiple physical houses are combined into a single architectural building. Each unit owner owns an identified plot of land and the building affixed to it, but that building is physically part of a larger building that spans lots. There is a continuous roof and foundation and a single wall divides adjacent townhouses. If there is an apartment below not owned by owner of townhouse, then it is not a townhouse, just a bi-level apartment/condominium. Legally, this is very similar to detached houses, but because of the intertwining of interests in the single architectural building, a homeowner's association is required. It would be impractical, for example to replace the roof of just one townhouse. But unlike the condominium, the townhouse complex's HOA owns none of the building or the land under it. It is essentially under contract to the townhouse owners to maintain the parts of the building that are hard to divide. Even the walls between townhouses are usually outside the purview of the HOA, being jointly owned and maintained by the owners of the townhouses on either side. Like the condominium, the townhouse complex often has common areas for roads, parking, clubhouses, and such. A rowhouse is like a townhouse except that the houses are not physically connected. They are independent structures that simply have no space between them. Technically, they are detached. A building with multiple residential units may simply be owned in common by multiple people, with each having specific rights to a particular unit and undivided interest in the rest. This is like a condominium, but there is no HOA with legal powers. It is much harder to govern, as the individual unit owners often have to agree unanimously or court intervention is required. California statutes recognize three kinds of "common interest developments": condominium, townhouse, and community apartment, with the latter being the owned-in-common concept described above. In Australia, condominiums are known as "strata title schemes" or "community title schemes". One in eight Canadian households lived in condominium dwellings, colloquially known as "condos", mostly located in a few census metropolitan areas according to Statistics Canada Condominiums exist in most parts of Canada though more common in larger cities. They are regulated under provincial or territorial legislation and specific legal details vary from jurisdiction to jurisdiction. In most parts of Canada, they are referred to as Condominiums, except in British Columbia where they are referred to as a strata and in Quebec where they are referred to as syndicates of co-ownership. The townhouse complex of Brentwood Village in Edmonton, Alberta, was the first condominium development in Canada (registered in 1967). With regular condominiums, the unit owner usually owns the internal unit space and a share of the corporation; the corporation owns the exterior of the building land and common area; in the case of a freehold condominium the owner owns the land and building and the corporation owns common shared roadways and amenities. The Canadian Condominium Institute is a non-profit association of condominium owners and corporations with chapters in each province and territory. The Condo Owners Association COA Ontario is a non-profit association representing condominium owners with divisions across the province and districts within the various municipalities. Apartments (Danish ejerlejlighed, literally "owner-apartment") comprise some 5% of Danish homes. They are traded and mortgaged on the same markets as free-standing houses, and are treated legally much like other forms of real estate. Each owner-tenant directly owns his own apartment; the rest of the building and the ground on which it stands is owned jointly by the apartment owners who execute their joint ownership through an owner's association. The expenses of maintaining the joint property is shared pro rata among the owners. Another 5% of Danish homes are in housing cooperatives (Danish andelsbolig), which occupy a legal position intermediate between condominiums and housing associations. The entire property is legally owned by a non-profit corporation in which the tenants own shares; each share carries the right and duty to lease an apartment from the cooperative. Shares can be bought and sold, but often the cooperative's rules strictly limit the price for which they may change hand. (In contrast, condominiums are traded on a free market). Because the official share prices are often lower than the market value and sellers often retain freedom to select whom to sell to, under-the-table payments are common. Current public policy favors condominiums over housing cooperatives, and recent legislation have aimed at making the latter more condominium-like. For example, since 2005, cooperative shares may be used to secure bank loans. (However, Danish mortgage banks still may not mortgage individual housing cooperative apartments). In England and Wales, the equivalent of condominium is commonhold, a form of ownership introduced in September 2004. As of 3 June 2009, there were 12 commonhold residential developments comprising 97 units in England and one commonhold residential development, comprising 30 units, in Wales. "Condominium" is not a term that is widely used in England and Wales, as commonhold is a creature of statute and comparatively rare, and condominiums are more likely to be found in the form of leaseholds. In English law it is not possible to enforce a positive covenant on successive owners of freehold land, other than to maintain a boundary fence, without creating an elaborate trust. A positive covenant is, broadly, one which involves the expenditure of money to perform. This did not create a significant problem until the 1950s, when "flats" (where ownership is divided horizontally) first began to appear on the market as more affordable particularly for first-time buyers. Until then flats had been confined to short-term unsaleable tenancies, with varying degrees of statutory rent protection and security of tenure. It was soon learned that freehold flats were an unsatisfactory form of ownership because it was not possible to impose essential maintenance requirements. As such, flats became virtually unmarketable because they were an unacceptable form of security to lenders. Thus solicitors, the principal property lawyers in England and Wales in those days, began to use leases instead, where such limitations did not apply. Progress was haphazard and piecemeal, but over time things became more standard. Improvements became universal as institutional lenders refused to advance money on the security of flats unless certain basic provisions were included. This benefited owners whether or not they borrowed money since purchase was invariably conducted through a solicitor or licensed conveyancer trained to reject leases failing to meet the necessary standards. Despite these standards, the actual form of leasehold systems is variable. Highly favoured are arrangements where the leases are granted out of a freehold owned by a corporation, itself owned by individual leaseholders. This provides an opportunity for them to participate in the proper management of the block. Again, quality of management is very variable. The statute creating commonholds was motivated by a desire to eliminate some of the problems and perceived injustices, such as the commercial exploitation of "lessees" by freeholders as their leases began to have too little time left to satisfy lenders. Since most leasehold developments are undertaken by commercial entities, commonholds did not become widespread. There are, however, other statutes in place that give some degree of protection for leaseholders. It is, nevertheless, essential to consider proper legal advice whenever engaged in the purchase of a flat, for the requirements for a fully marketable flat remain complex. Law of Property Act 1925, s.153, contains provisions for the "enlargement" of leases into freeholds, one of the effects of which is to preserve the enforceability of positive covenants contained in the lease against the resulting freehold. There are clear, but stringent, requirements. Artificial schemes using the provisions to create enforceable positive covenants in freehold blocks of flats were occasionally mooted but never gained currency. Scotland has a separate legal system from England and Wales and is a separate consideration. In Finland, a condominium-like arrangement where the ownership of the real estate is assigned to specific apartments (Finnish: hallinnanjakosopimus, Swedish: avtal om delning av besittningen) is usually used only with detached or semi-detached houses. A housing cooperative is a common form of home ownership in Finland. Owning shares that correspond to one apartment in a housing company is generally considered as much owning your own home as actually directly owning a (single family) house. However, shares are not considered as real estate but as personal property and the co-op can take the possession of the apartment for a term time and evict the tenant or owner because of disturbance or unpaid maintenance fees. Finnish housing cooperatives are incorporated as (non-profit) limited-liability companies (Finnish: asunto-osakeyhtiö, Swedish: bostadsaktiebolag), where one share usually represents one square meter (sometimes ten) of the apartment. Membership of a condo is obtained by buying the shares on the open market, most often through a real estate agent. No board approval is needed to buy shares. There is usually no requirement for the owner(s) to live in the condo. Owning of apartments for rent is a common form of saving and private investment in Finland. Condominiums are known as "private housing estates" (as opposed to "public housing estates") in Hong Kong. Condominiums (Hungarian: "társasház") were formally introduced in 1924. Condominium properties are traded and mortgaged on the same markets as free standing houses, and treated much like other forms of real estate. The condominium acts as a non-profit legal entity maintaining the common areas of the property, and is managed by a representative elected by the owners' convention. Decisions that involve changes to the terms and conditions, or larger common expenses need to be approved by the convention, where voting power is based on the percentage of property owned. Actually, condominium is a frequent legal form of housing in Hungarian cities where privatization of state or municipality-owned flats were effected mainly in the 1990s. In India, condominiums are known as "Apartment Buildings" or "Flats". Each building consists of multiple floors and flats with different configurations. The most common configurations are "1-BHK", "2-BHK" and "3-BHK" (BHK stands for bedroom-hall-kitchen). The association of home owners is usually called a Co-operative Housing Society (CHS) which needs to be registered with the municipal authorities. In Israel, condominiums (known "בתים משותפים", "shared houses" or "cooperative houses") are a common form of home ownership. Public housing has historically been organized as subsidized purchase and mortgages in government-constructed condominiums. In Italy, the condominium ("Condominio") is governed by law, last reformed in 2012. Co-ownership of the common parts of the buildings (such as the stairs, main walls, facades, roof, courtyards) is mandatory: a landlord can not give up the right on common parts for not paying the costs. 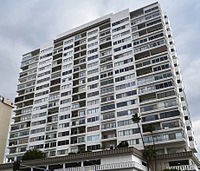 Each owner's quota in the condominium is expressed in thousandths ("millesimi") of the whole; these are used to determine majorities in owners' assemblies ("assemblee condominiali"). See housing cooperative under owners association. Condominiums (Norwegian Eierseksjon) were formally introduced in 1983. Approximately 19% of Norwegian homes are condominiums, as approximately 50% of the owner-occupied flats and duplexes, approximately 30% of the rowhouses and 2.5% of the detached houses are organised as condominiums. Title "Condominiums" is not used in Pakistan rather they are called "Flats" for average style building while "Complexes" for sophisticated and larger buildings. Minimum floors for a building to be classified as "Flats" is four, with a requirement for having at least one elevator or lift for buildings upwards of four floors. Almost all have a separate room called the "Drawing Room", used for guest entertainment purposes. However, its use as TV room and dining room is common. Another unique feature is the balcony or "terrace", which are standard for all flats. In Singapore and Malaysia, "Condo" or "Condominium" are terms used for housing buildings with some special luxury features like security guards, swimming pools or tennis courts. In Singapore, most housings without such features are built by the governmental Housing Development Board (HDB), and such HDB units can be possessed for rent or individually bought from the government. Condominiums and HDB flats make up the overwhelming majority of available residential housing in the country. In South Africa, condominiums are known as "Sectional Title" properties, and are governed by the Sectional Titles Act No. 95 of 1986. Town-house complexes and many apartment blocks typically have this form of title. The owners of the complex constitute the Body Corporate, and the Body Corporate elects a group of Trustees to manage the day-to-day management of the complex, who often hire a company specialising in complex management, known as a Managing Agent. On 1 May 2009, condominiums (ägarlägenheter) became available for the first time under Swedish law. Of the 14,447 newly built apartments completed in 2009, only six were condominiums. A majority of production, 7,723 units, were apartments in housing cooperatives (bostadsrättslägenheter), the traditional form of owner occupied apartment housing. As of late 2014, there were 955 condominiums total throughout all of Sweden. Nationwide, as of February 2018, Bangkok represented 58% of Thailand's new construction condominium market while the other provinces accounted for the remaining 42%. The unit type has seen steady growth in the Thai market over the previous decades, in contrast to the declining percentage in the traditional detached house. The condo development trend continues nationwide as dozens of projects are in progress in Bangkok, several others are underway in the Eastern Economic Corridor provinces of Chon Buri and Rayong, and to the west in Phetchaburi and Prachuap Khiri Khan. Section 234 of the Housing Act of 1961 allowed the Federal Housing Administration to insure mortgages on condominiums, leading to a vast increase in the funds available for condominiums, and to condominium laws in every state by 1969. Many Americans' first widespread awareness of condominium life came not from its largest cities but from South Florida, where developers had imported the condominium concept from Puerto Rico and used it to sell thousands of inexpensive homes to retirees arriving flush with cash from the urban Northern United States. The primary attraction to this type of ownership is the ability to obtain affordable housing in a highly desirable area that typically is beyond economic reach. Additionally, such properties benefit from having restrictions that maintain and enhance value, providing control over blight that plagues some neighborhoods. Over the past several decades, the residential condominium industry has been booming in all of the major metropolitan areas such as Miami, San Francisco, Seattle, Boston, Chicago, Austin, Los Angeles and New York City. However, in recent years, supply within the condo industry has caught up with demand and sales have slowed. It is now in a slowdown phase. An alternative form of ownership, popular in parts of the United States but found also in other common law jurisdictions, is housing cooperative, also known as "company share" or "co-op". A Housing Cooperative is where the building has an associated legal company and ownership of shares gives the right to a lease for residence of a unit. Another form is ground rent (solarium) in which a single landlord retains ownership of the land (solum) but leases the surface rights (superficies) which renew in perpetuity or over a very long term. This is comparable to a civil-law emphyteusis, except that emphyteusis shifts the duties of up-keep and making improvements onto the renter. In the United States, there are several different styles of condominium complexes. For example, a garden condominium complex consists of low-rise buildings built with landscaped grounds surrounding them. A townhouse condominium complex consists of multi-floor semi-detached homes. In condominium townhouses, the purchaser owns only the interior, while the building itself is owned by a condominium corporation. The corporation is jointly owned by all the owners, and charges them fees for general maintenance and major repairs. Freehold townhouses are exclusively owned, without any condominium aspects. In the United States this type of ownership is called fee simple. ^ "Using DNA to Fight Dog Owners' Discourtesy in Brooklyn". ^ "Comunidades de propietarios y no comunidades de vecinos". Comunidades. ^ "Comunidades de propietarios: lo que hay que saber - Madrid.org - Portal del Consumidor". Madrid.org. Retrieved 2018-07-19. ^ "Vivienda | Comunidad de Madrid" (in Spanish). Madrid.org. 2018-06-27. Retrieved 2018-07-19. ^ "Understanding the Government of a Community Association". Kaman & Cusimano. Archived from the original on 2012-01-15. Retrieved 24 July 2011. ^ "Community title schemes". ACT Planning and Land Authority. ACT Planning and Land Authority’s (ACTPLA) website. ^ "Body Corporate Legislation in Queensland". Queensland Government. ^ "Condominium dwellings in Canada". www12.statcan.gc.ca. ^ a b c Condominium Buyers Guide (PDF). Canadian Mortgage and Housing Corporation. ISBN 0-662-33517-1. Archived from the original (PDF) on 2013-06-11. Retrieved 2011-02-26. ^ "Ontario moves to license condo managers". Rem online. Retrieved 2013-08-26. ^ a b Statens Byggeforskningsinstitut og Amternes og Kommunernes Forskningsinstitut. "Det danske boligmarked - udvikling i boligforsyning og boligønsker" (PDF). Archived from the original (PDF) on 2011-07-19. Retrieved 2009-10-12. ^ "Condominium Act (WEG)". Accentro.co.uk. Archived from the original on 2018-07-19. Retrieved 2018-07-19. ^ "הבית הקבלני המשותף בישראל". Archived from the original on 2017-02-11. Retrieved 9 February 2017. ^ "Italian's condominiums". Retrieved 21 January 2016. ^ Mercado, Caren. "A Guide to Residential Spaces in the Philippines (Part 1)". kmcmaggroup.com/. KMC MAG Group. Retrieved Sep 17, 2014. ^ "SECTIONAL TITLES ACT NO. 95 OF 1986". Chief Surveyor General of the South African Government. Retrieved 8 February 2013. ^ Oficina de Información de Vivienda, ed. (2012). Guía práctica: Comunidades de propietarios [Condominiums: The Practical Guide] (PDF) (in Spanish). Ayuntamiento de Madrid. p. 7. Las comunidades de bienes se regulan por las normas contenidas en el Código Civil, en tanto que la comunidad de propietarios encuentra su regulación en la Ley de Propiedad Horizontal. ^ Marcos Aurelio Casado Martín (1999). Comunidad de Propietarios: Las Nuevas Leyes de Propiedad Horizontal y de Multipropiedad [Condominiums: The New Laws of the Horizontal Property and Timeshare] (in Spanish). Madrid: EDOCUSA. ISBN 84-86939-17-8. ^ Juana Viúdez (4 June 2013). "Cómo conseguir el certificado energético, de la A a la G". El País (in Spanish). Retrieved 29 August 2013. Teniendo en cuenta que, según los últimos datos del INE, en España hay en torno a 840.000 comunidades de propietarios en casi nueve millones de edificios de viviendas, ese gasto global asciende a unos 5.040 millones de euros. ^ Landes, David (11 November 2008). "Owner-occupied flats coming to Sweden". The Local. ^ "Få ägarlägenheter i nyproduktion, korrigerad 2010-10-26" (Press release) (in Swedish). Statistics Sweden. 6 May 2010. Archived from the original on 2010-12-30. Retrieved 2010-12-29. ^ "Fastighetsfakta årsrapport 2014" (PDF). ^ "Bank of Thailand (Statistical Data) Property Indicators". Retrieved 2019-03-19. ^ "National Housing Authority (NHA) Kingdom of Thailand" (PDF). Retrieved 2019-03-19. ^ "Bangkok Real Estate Pricing, Yields, and Scores". Retrieved 2019-03-19. ^ Poliakoff, G: Law of Condominium Operations, §1.2. 2009. ^ a b "Information Report No. 159" (PDF). American Society of Planning Officials. June 1962. Archived from the original (PDF) on 9 September 2013. Retrieved 27 July 2014. ^ Natelson, Robert (1987). "Comments on the Historiography of Condominium: The Myth of Roman Origin" (PDF). City of Oklahoma Law Review. 12 (1). Retrieved 12 Feb 2014. ^ Kerr, William (2013). "Condominium - Statutory Implementation". St.John's Law Review. 38 (1). Retrieved 27 July 2014. ^ Carter, Charles; Marcus, Allen. "Pets, Politics, and Condominium Prices" (PDF). Archived from the original (PDF) on 27 July 2014. Retrieved 27 July 2014. ^ Clarke, Katherine (13 June 2014). "Sales slow at high-end condos as pricey pads grow plentiful around city". New York Daily News. Retrieved 27 July 2014. ^ Cheung, Maria. "The Art of Wooing a Co-op/Condo Board". Retrieved 27 July 2014. ^ "Understanding Ground Rent in Maryland". The People's Law Library of Maryland. Retrieved 27 July 2014. ^ "What is EMPHYTEUSIS?". The Law Dictationary. Retrieved 27 July 2014. ^ "Condominium vs. Townhouse" (PDF). Retrieved 27 July 2014. ^ Bruce, John. "Review of Tenure Terminology" (PDF). University of Wisconsin. Retrieved 27 July 2014. ^ "340 E. 64th Street - Habitat Magazine". www.habitatmag.com. Wikimedia Commons has media related to Tenement houses. Look up condominium in Wiktionary, the free dictionary.